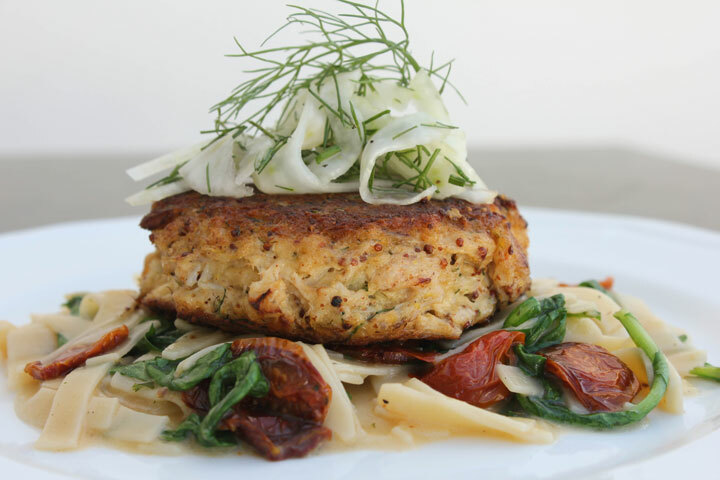 We’re eating buttery sauteed lump crab cakes served over Knorr Italian Sides Scampi Fettuccine enhanced with oven-dried grape tomatoes, arugula & lemon zest and topped with a garnish of bright grapefruit marinated shaved fennel salad. Love can also make you do crazy things like feel the need to go out to a wildly expensive Valentine’s dinner where you eat course after course of decadent food. When you walk away, you’re so stuffed that you just want to go to sleep rather than enjoy the… uh, companionship of your loved one. 😉 I much prefer staying in on Valentine’s Day, eating a relatively light meal then spending the rest of the evening exploring and celebrating the bonds and connections of the one I’m with. Tomorrow, rather than going out and dropping a load of money, stay in and give this recipe a try. It’s super quick and easy, not too heavy, and guaranteed to impress. Happy Valentine’s Day, everybody! Xoxo! Preheat a large saute pan over medium heat for 4-5 minutes until hot. While the pan is preheating, in a bowl, mix together first 8 ingredients (through the crab meat) until evenly incorporated, trying not to break up the large lumps of crab. Form mixture into two evenly sized patties. Add the canola oil and butter to the preheated pan. Once butter has melted, add crab cakes to the pan. Cook crab cakes over medium heat for about 4-6 minutes or until a golden brown crust is visible around the bottom of the cakes. Carefully flip the crab cakes using a wide spatula and cook for another 4-6 minutes until golden. To serve, place half of the scampi on a plate, top with a crab cake then add half of the fennel salad on to the crab cake. If desired, garnish the stack with a fennel frond. Buen Provecho! Cook Knorr Scampi according to directions on the packet, using butter. Once removed from the heat to let stand, stir in remaining ingredients until the arugula is wilted. Let stand as directed for 2 minutes. Serve hot. In a bowl, mix together shaved fennel and grapefruit juice. Season to taste with kosher salt and freshly cracked black pepper. Refrigerate for 1 hour to allow flavors to marry. Stir in chopped fennel fronds, taste and readjust seasoning with kosher salt and freshly cracked black pepper as desired. I don’t usually go for crab cakes because I’m always afraid they will be mushy and I really dislike mushy crab cakes. These crab cakes have a beautiful sear. I could definitely go for these on Valentine’s Day, but unfortunately, I will be in class becoming familiar with skeletons. Crabs are really hard to cook, no matter what dish it is. Did you study at a culinary school or do you just really love cooking? Coz this looks terrific! You have a knack for food photography too, to add to that. I’ve had a love affair with crab cakes for many, many years. But for the last 5 or 6 years I do not recall having them very much. So, I’ve decided I’m going to make some crab cakes since it has been so long since I’ve had them. So, thanks for the recipe and I will look forward to eating those mouth-watering crab cakes very soon. Thanksgiving Desserts! Keep it Classic or Change it up? Wordless Wednesday: You've heard of 'Jack-in-the-Box' but have you heard of 'Albert-in-the-Bag'? Festive Friday: Let the Season Begin! © Copyright 2019 Amanda Simpson. All Rights Reserved.